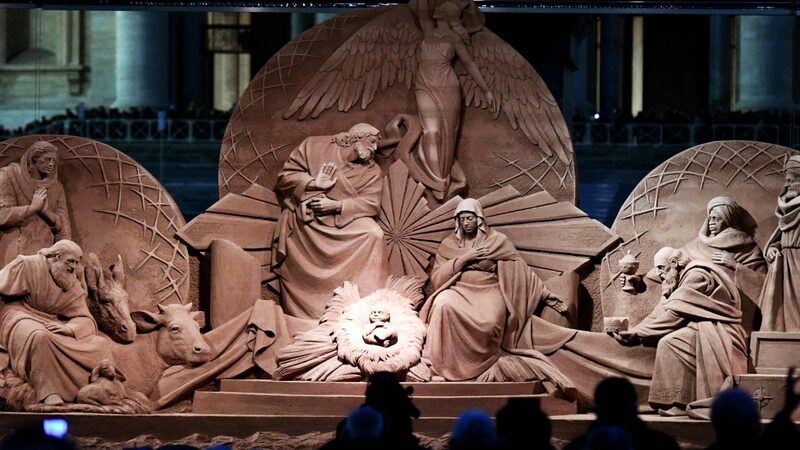 This year, the crib of St. Peter’s Square is a 16 m long, 5 m high and 6 m deep sand sculpture. It took 20 large trucks to transport 700 tons of sand from Jesolo in northern Italy to St Peter’s Square. Ten workers carried out the operation of compacting the sand to make it more consistent, and then mounted the roof that protects the whole scenery from the elements. Over the next two weeks, four international sculptors with experience in this type of material joined forces to sculpt the figures: Richard Varano (from the United States), Ilya Filimontsev (from Russia), Susanne Ruseler (from the Netherlands) and Rodovan Ziuny (from the Czech Republic). Richard Varano has won the world title of sand sculpture eleven times and the others are also top sculptors in this specific field. The relief is divided into three large sections: the Holy Family in the center, the adoration of the shepherds on the left and the Magi kings on the right. 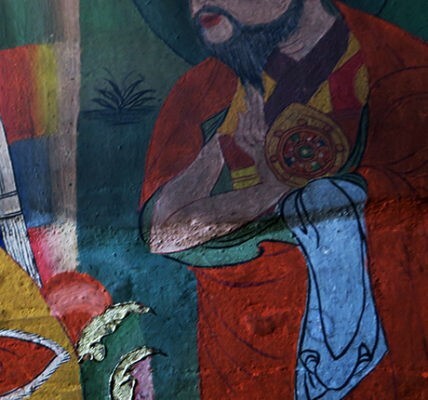 In addition, several Angels populate the scenery. All the figures converge to the Child Jesus, in great prominence. The municipality of Jesolo organizes sand nativities for many years, but this time the challenge was greater. The four sculptors chosen by the municipality did not just want to surprise tourists, they wanted to help the pilgrims pray. And, of all opinions, those four and the whole team of Jesolo were anxious to know the Pope’s opinion. Therefore, the culminating moment of the two weeks of work was on December 7, when Francis went down to St Peter’s Square to see the crib and the Christmas tree next to it. Enthused by the splendor and beauty of the whole set, the Pope delivered a profound meditation about Christmas, broadcast by television in several countries. When the Pope concluded his reflections on Christmas and greeted the sculptors, they felt like floating on a cloud. They could not imagine a more intense moment. The two previous weeks they worked strenuously on that enormous sculpture, intended and cast with such a strong purpose. At the end, listen the Pope himself interpret their work!… For the sculptors and for the whole team, this year the Christmas gift arrived earlier.